Letchworth Park as Presently Governed"
We have been seeking conclusive evidence of the mechanics of the change that took place to remove the American Scenic and Historic Preservation Society (ASHPS) as being in control of Letchworth State Park. This has led us on a search of the Annual Reports of the Society which we discovered are not easy to find as we approached the pivotal 1930 year. The New York City Public Library ended up as custodian of all the Society documents and extracting Letchworth information is not easy and their staff is limited in the amount of time they can spend searching for us. A visit in person by appointment would be necessary to establish a detailed record of events that led to the change of management. 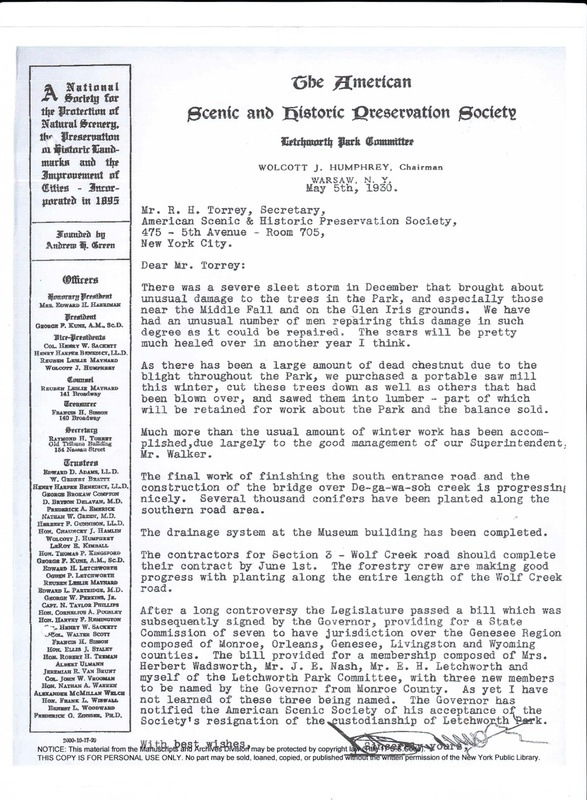 With three documents we think we have found how the society became involved to begin with, how the Society was relieved of their responsibility and exactly when the Genesee State Park Commission was created. 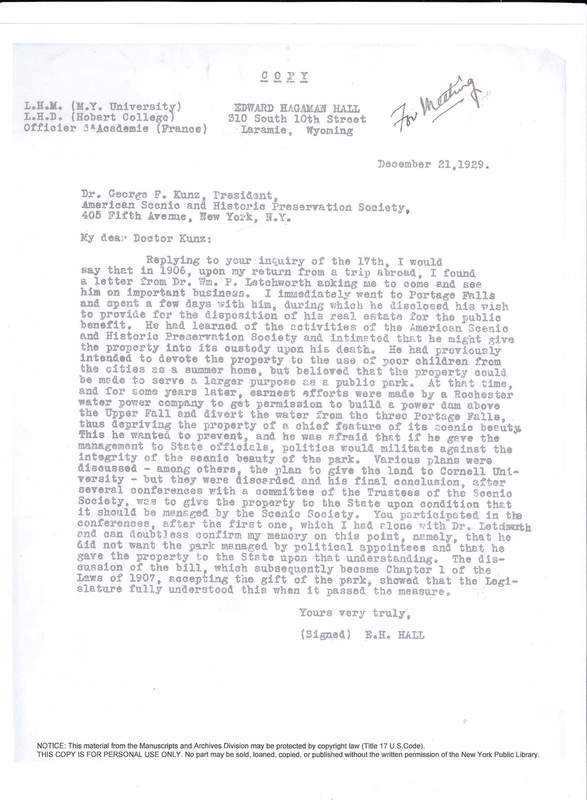 The first document is a letter dated December 21, 1929 from Edward Hagaman Hall to Dr. George Kunz, President of the American Scenic and Historic Preservation Society at the time. In it Hall describes the discussion he had with Mr. Letchworth in 1906 regarding the gift of the Glen Iris to the State and the role of the Scenic Society. 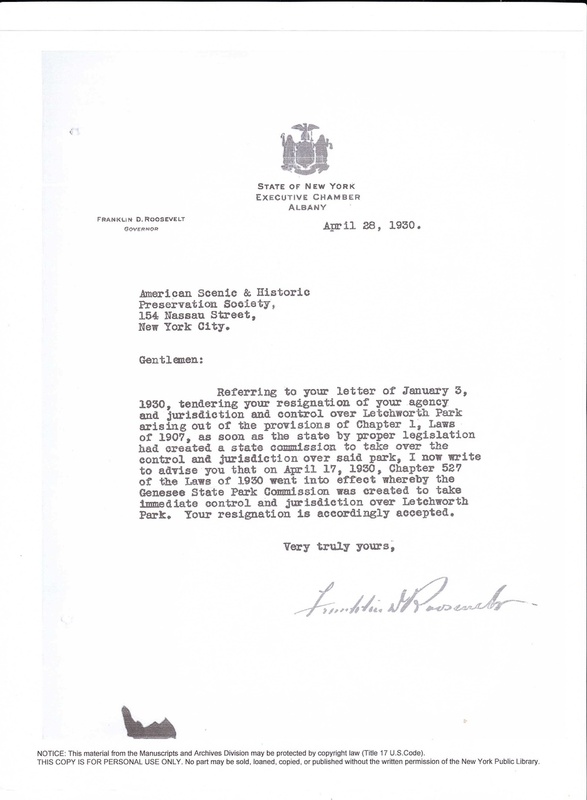 The second is a letter from then Governor Franklin D. Roosevelt dated April 28, 1930 to the American Scenic and Historic Preservation Society accepting the Society's resignation, removing their "jurisdiction and control" over Letchworth Park. The last is a May 5th, 1930 report from Society's Letchworth Park Committee chairman, Wolcott Humphrey to the Secretary of the ASHPS. In what may have been one of the last of the Committee's reports to the Society, Humphrey discusses the last of the Society's projects and notes the creation of the new Genesee State Park Commission. An extra bonus in this document was the date that the sawmill was purchased. It is still in use today with modifications that enable production of finished lumber suitable for use in places like the dining room of Glen Iris. We thank the helpful staff member at the New York Public Library who provided the three documents and, as the institution requires, we note that all three documents are from the “American Scenic and Historic Preservation Society records, Manuscripts and Archives Division, The New York Public Library, Astor, Lenox, and Tilden Foundations" and thank the New York Public Library for permission to use them on our site. For more information on the American Scenic Preservation Society and the how Letchworth Park is governed, see our Glimpse "Evolution of the Park Administration."